Ermac's Robe: Once worn by the evil demigod Ermac, this unholy relic renders its wearer immune to clerical turning, all forms of sunlight, holy words, and banishment. The robe also exudes protection from good in a 10' radius. Any non-undead who dons the thing loses 1 life energy level per day until s/he dies and is reborn as a wraith. dust of death: This dust forms a swirling dark cloud of 10' diameter. Anyone within this cloud must save vs death magic at -3 or lose one life energy level per round spent in the cloud. This dust also has the side effect of healing energy-draining undead (3 hp per round spent within the cloud.) Once used, the dust hangs in the air for one hour. As a Suel Lich, Xusia must possess, use, and consume host bodies. Any such body will have coarse, leathery skin as well as eyes that glow with black flame. When Xusia has possessed a body for awhile, it will weaken and burn out. Just before this happens, the body will appear as a wrinkled husk whose entire head is bathed in black fire. Xusia was a powerful wizard of the Suel Empire, many ages past. 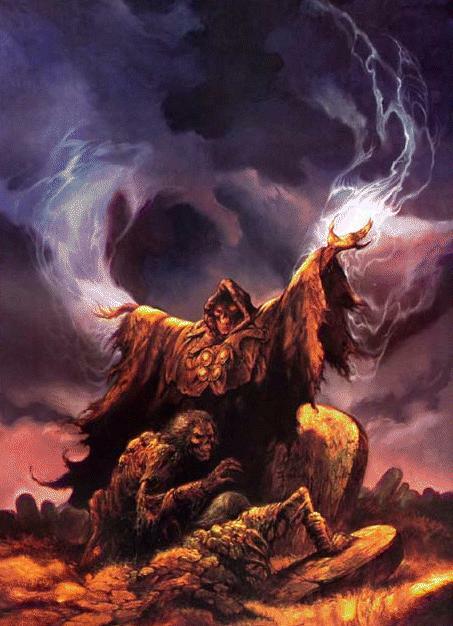 Mortal death was not enough to claim his evil spirit, and thus he became one of the most powerful of undead, a lich. His foul deeds were the stuff of nightmares, and he was feared throughout the ancient world. Legend has it that he finally met his end in the conflict that brought the Invoked Devastation and Rain of Colorless Fire down upon the world more than a thousand years ago. However, this was not the case. Despite suffering tremendous amounts of physical and magical damage, the lich had been saved by a contingency enchantment and whisked away to a secret stronghold. There, he recovered, slumbering through the death of the Suel Empire and the centuries that followed. His deeply-buried tomb became covered with dirt, rock and, eventually, the forest that men now call the Suss. Xusia was inadvertently awakened and freed in 7/574 C.Y. by a band of adventurers who found and plundered the buried city. He escaped undetected to parts unknown, where he quickly regained his full strength and assessed the current state of the world. Just over two years later, on the forsaken Isle of Woe, the lich's first plot was stopped by some of the same adventurers who freed him; his greatest unholy relic - the mighty death-scepter - was shattered. Xusia escaped, however, and retreated to the Vast Swamp. There, in the hidden depths of Castle Mukos, he began to build his ultimate stronghold: a necropolis, a city of the dead. This plan, too, was foiled - again, by some of the same adventurers. Worse, Xusia lost a hand as well as much face in the eyes of his liege, the demon lord Orcus. The arch-lich escaped again, retreating to parts unknown to lick his wounds. His hatred of the mortal enemies who had now defeated him twice grew, soon knowing no bounds. A weaker being might have given up, but instead, Xusia resolved to find allies...and the Nine, and then their stronghold, were born. Although Xusia can kill lesser foes with a touch, he prefers to utilize his vast array of spells. Typically, he will prepare several defensive spells before combat and then, thusly protected, proceed to decimate foes with various sorts of deadly magic. Given his rings' doubling of all of his 1st through 5th level spell capabilities, Xusia is not likely to run out of useful magic during a battle. Xusia is much older than any of the others, and has been through a lot more. He has watched empires rise and fall, in some cases hastening these processes. He has had lifetimes to plot and plan. In addition, he is an undead being, more at home with the dead than the living. As a result of these factors, Xusia has a different (and secret) agenda than his fellows among the Nine: he desires nothing short of turning Oerth into a world of the dead, the ultimate manifestation of his and Orcus' power. Doubtless, if the others knew this, they would turn against him; as they do not know (and never will) they are useful allies to Xusia. The lich's plan is to use the others to get as far as possible toward his ultimate goal, and then take over and see things through to their ghastly conclusion. He is aware that this process may take many years, but time has very little meaning to the lich, and he can be as patient as he needs to be. Xusia has one secondary goal as well: he wants revenge on the elf Belphanior and his adventuring companions for their history of thwarting his (and Orcus') plans. He especially hates Belphanior, who once dared to hold a blade to his throat, a unique blade that could have actually killed him. Xusia has vowed never to let this happen again, just as he has vowed to have his revenge, no matter the cost in magic or lives. Xusia does not require sustenance or sleep, and has been known to work for weeks at a time. He does not care for idle talk or socializing. Xusia considers himself the leader of the alliance, and his behavior reflects this. He has no particular like or dislike of any of the others - they and their resources are simply tools, a means to an end. For their part, the other eight members of the alliance may not care for the lich...but they respect and fear him.